Answer: What you saw is called a 22° Moon halo. It’s an atmospheric phenomenon due to hexagonal ice crystals that form at very high altitudes, typically 30,000 feet or more. The image above shows a 22° halo around a Full Moon. The Moon is overexposed to show the fainter halo, so the bright blob in the center is much larger than the actual Moon. The dark dot in the center is a separate image of the Moon superimposed to the correct size. Like raindrops, ice crystals can bend rays of light that pass through them, a process known as refraction. 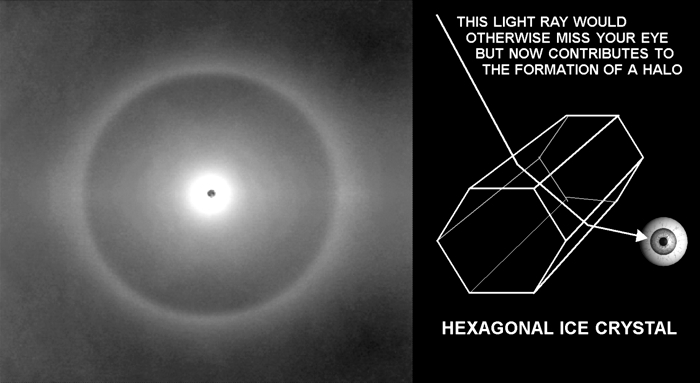 Because the crystals tend to fall with their long axes parallel to the ground, their cumulative effect is to generate a geometric pattern of light seen from the ground as a circle of light with a diameter of 22°. Sometimes there are also faint colors visible in the halo, similar to what you see in a rainbow, but rarely as intense. Halos are common during the winter, especially when a front delivers high-altitude moisture. Folklore about halos abounds. One myth says “The number of stars you can see inside the halo is the number of fair weather days to follow.” Of course, as with horoscopes and other popular myths, such predictions are rarely accurate.